Oct. 18, 2017 2:13 p.m.
After a five hour standoff in Revelstoke, a man, allegedly wanted in connection with a Calgary homicide, died at the scene. The Independent Investigations Office (IIO) BC has been called to Revelstoke as per protocols, following the incident. According to Staff Sgt. Annie Linteau, police pulled over a vehicle about 1:30 p.m. wanted in connection to an ongoing Calgary homicide investigation. “Officers believe the driver matched the description of the person of interest wanted for questioning and considered armed and dangerous in connection with the Calgary investigation,” she stated in a release. Officers set up containment around the vehicle, evacuated members of the public from neighbouring businesses, and a three block perimeter of the area was established. Additional emergency response resources, including the Revelstoke Fire Rescue Service, were staged nearby to support the ongoing incident. No shots were fired by police. BC Ambulance was called in and provided medical assistance. The man succumbed to his injuries inside the vehicle — no one else was injured. Police will remain on scene throughout the evening. The BC Coroner Service is working positively to confirm the identity of the deceased man and the exact cause of death. RCMP continue to work with the Calgary Police Service Homicide Unit on this investigation. The Independent Investigations Office has been deployed to Revelstoke following a standoff between RCMP and a man in a silver vehicle. The police watchdog has yet to release any further details. Following a loud bang, BC Ambulance was called to a blocked off area on Victoria Road in Revelstoke. RCMP were heard telling residents the scene was now secure and emergency crews are in the process of leaving. It’s unclear what happened following the loud noise and if anyone was injured. Police have not officially commented on the situation. RCMP have surrounded a silver vehicle reportedly wanted in connection with a homicide in Calgary. More than a dozen armed officers have surrounded the silver Toyota Corolla with Alberta plate BKW 1855. That vehicle is connected to a man currently on the run from the Calgary Police Service. According to a Calgary police press release, Mohammadali Darabi, 32, of Calgary, is being sought in connection with the death of his roommate, a man in his 20s who was found deceased Sunday afternoon. “At approximately 4:45 p.m. on Sunday, Oct. 15, 2017, police were called to a residence on the 2300 block of Oakmoor Drive S.W., after a man was found deceased inside the home by a family member,” writes the Calgary Police Service Homicide Unit. Detectives believe Darabi left the residence on Oakmoor Drive Sunday afternoon and was last seen driving a silver-coloured, 2006 Toyota Corolla with Alberta plate BKW 1855. BC RCMP have not yet confirmed the connection between the two incidents. Witnesses on scene say police were yelling ‘Mohammad’ at the vehicle. The man in the vehicle reportedly spent the night in Revelstoke and his credit card use alerted RCMP to his location. More than a dozen uniformed officers are on scene at a standoff in Revelstoke with guns drawn at a silver-coloured vehicle. Officers have not yet approached the car but more officers have now put on tactical gear and police vehicles have been moved to block the public from the scene, creating a barrier around the vehicle. Victoria Road is shut down in both directions for at least four blocks at the intersection of Victoria and Wynn Street. RCMP are not yet releasing any official information. The public is asked stay away from the area for their safety. 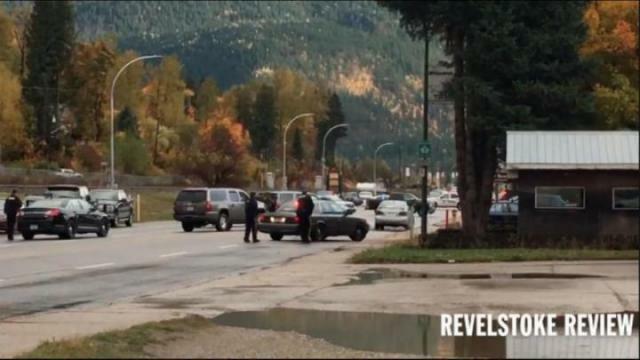 RCMP in Revelstoke are currently dealing with a standoff situation on Victoria Road. A man has locked himself in a small grey car and for the last 30 minutes police have been asking him to step outside. Officers have their weapons drawn and pointed at the vehicle. We’ve been told to move back by the local fire service. The public are being asked to stay away from the area near Flow Bike Rentals, where the incident is unfolding. There are at least four officers on scene along with emergency personnel. Reports indicate more RCMP from surrounding ares such as Sicamous are being sent to help.